Nico Rosberg won the Formula One Brazilian Grand Prix Sunday, ensuring that his championship fight with Mercedes teammate Lewis Hamilton will not be resolved until the final race of the 2014 season. Rosberg was quickest in every practice session, quickest in qualifying, and second-quickest in the race behind his British rival—but the German driver, facing championship elimination if he didn’t win, drove a flawless race, while 2008 champion Lewis Hamilton had an off-track excursion which likely cost him the race. 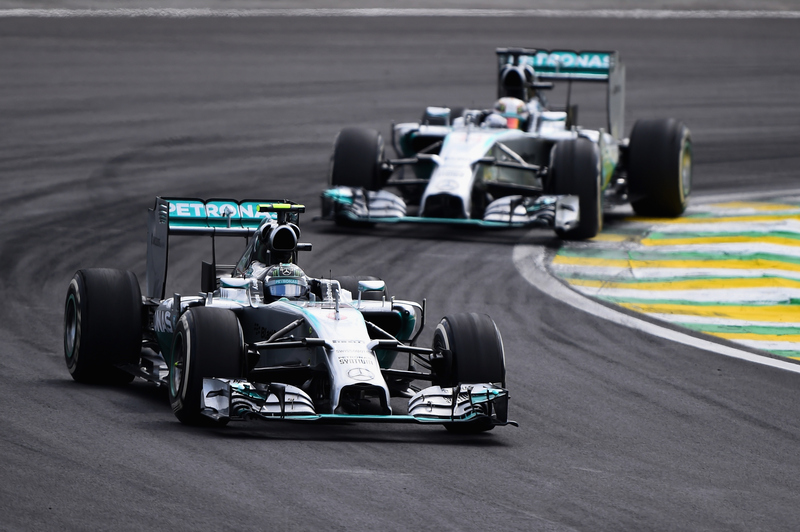 The newly repaved 2.7-mile Interlagos track ate up tires at a fierce rate, making tire management a key concern. Both Mercedes drivers started on Softs, which lasted barely half-a-dozen laps. Rosberg surrendered the lead to Hamilton in the pits, then took it back when Hamilton pitted. Both Mercedes drivers got 20 laps out of their Mediums. Rosberg pitted on lap 27 (of 71) giving Hamilton the lead and a huge advantage: the British driver had a chance to turn a demon lap and gain time on Rosberg, who had to watch the pit lane speed limit. Hamilton slid wide and had to drive right off the track to catch the slide. By the time he got back on pace he had lost almost eight seconds, and Rosberg had a secure lead. It might have been pressure, it might have been tires worn more than anyone realized; whatever it was, something went wrong for Lewis Hamilton as he negotiated Turn Four. Hamilton didn’t let the setback faze him; nor did Rosberg let his good fortune go to his head. The pair drove the rest of the race at the limit, trading fastest laps, twitching and sliding and pushing their cars as hard as they could. Hamilton tried hard, but Rosberg was much quicker through the high-speed switchbacks of the second sector of the track. Hamilton got as close as half a second, but even using his Drag Reduction System rear win adjustment, he couldn’t get next to his teammate. Rosberg crossed the line 1.4 seconds ahead of his teammate. The win cuts Hamilton’s lead over Nico Rosberg to 17 points, 334–317. With the season-ending Abu Dhabi Grand Prix worth double points, Rosberg needs to win outright to take his first Drivers Championship—but Hamilton can capture his second by finishing second, with 370 points to Rosberg’s 367. Brazil was Rosberg’s fifth win of the 2014 season, but Hamilton has won ten times and finished second at three of Rosberg’s wins. Both Mercedes carts have been reliable, so Rosberg cannot count on a mechanical failure taking out Hamilton and not himself. Further, Hamilton will know that he doesn’t have to beat Rosberg—he just has to beat everyone else (which hasn’t been too much trouble this year) and then follow Rosberg home to take the title. The Formula One Abu Dhabi Grand Prix takes the green flag at 8 a.m. EST on Sunday, November 23. Visit Formula1.com for tickets and travel packages. 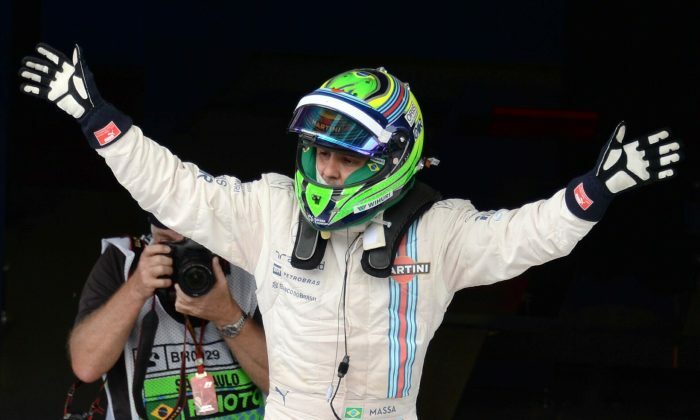 Brazilian driver Felipe Massa put in a performance on par with either Mercedes driver in his Williams, finishing third ahead of former World Champions Jenson Button, Sebastian Vettel, and Fernando Alonso—drivers with a total of seven WDCs between them. As if beating the best from McLaren, Red Bull, and Ferrari wasn’t enough, the Williams driver had to overcome a five-second penalty for speeding in pit lane. For the crowd at Interlagos, seeing one of their own on the podium was a huge thrill, which they made amply evident by the volume of their cheers. For Massa, his success meant even more. After coming within one point of winning the WDC in 2008, winning six poles and six races, Massa was almost killed in a freak accident while qualifying for the Hungarian Grand Prix. A spring fell off Jenson Button’s McLaren and bounced back into the trailing Massa, striking the then-Ferrari driver above the left eye. After sitting out the rest of the season, Massa returned to racing in 2010 (with a titanium plate in his skull) and continued to drive for Ferrari, but he never quite regained his form and when his contract expired after the 2013 season, the Scuderia dropped him. 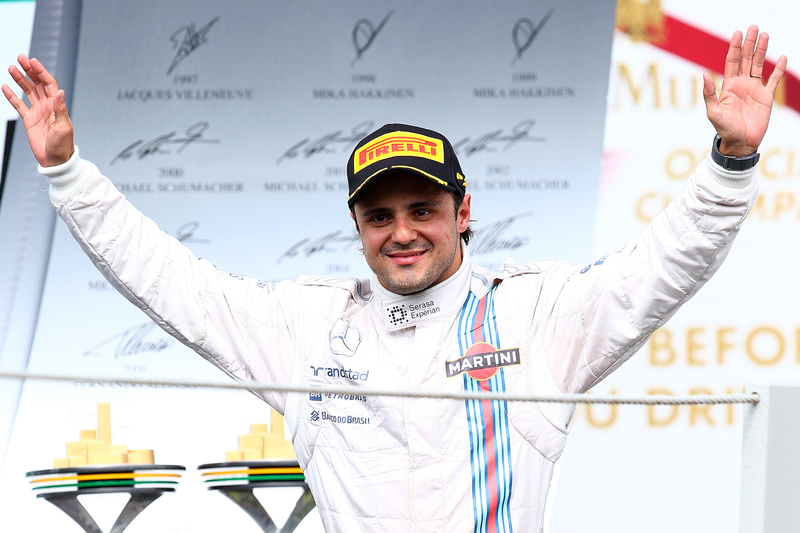 Massa was generally considered lucky to sign on with Williams, a once-dominant team which had fallen to mid-pack. However, the 2014 Williams chassis, powered by Mercedes engines, turned out to be quicker than much of its competition. Massa and young Finnish teammate Valtteri Bottas have been challenging for wins, particularly later in the season. Bottas in sixth in points, Massa eighth, but Williams lies third in Constructors points with 254, leading Ferrari with 210 and McLaren with 161. Regardless of where Felipe Massa finishes in the points, his performance at Brazil shows that his F1 career is far from over. The mighty do fall, and when they do, it looks dramatic no matter how small the actual slide. Ferrari, which dominated Formula One through the first years of this century, suffered chassis troubles for a few years, but in 2014, the Scuderia has had the most humiliating weakness possible: its turbocharged V6 engine is down on power. Ferrari, which long built the preeminent racing engines, hired a pair of World Champions, Fernando Alonso and Kimi Räikkönen, and ended up struggling to give either of them a car which could even approach the podium. Alonso managed second at Hungary and third at China; Räikkönen has none this season. At Brazil, Räikkönen, who has been struggling even more than the car could account for, seemed comfortable. Even after losing precious seconds when the front jack failed during his second pit stop, the Finn fought back to take sixth by lap 52—with Fernando Alonso right on his tail. This pair battled fiercely for several laps with Alonso—who many consider to be the best driver on the grid, and second-best overtaker behind Hamilton—unable to get past his teammate. Neither driver cut the other a millimeter of slack, driving as though sixth place was the top of the p[odium—as if the only real race for Ferrari wasn’t winning constructors points. Finally on lap 68 Alonso made the pass—but it looked as though Räikkönen might have been ordered to let Alonso by. Ferrari’s new F1 manager Marco Mattiacci probably envisioned the pair eliminating each other—and the team’s Constructors title hopes. 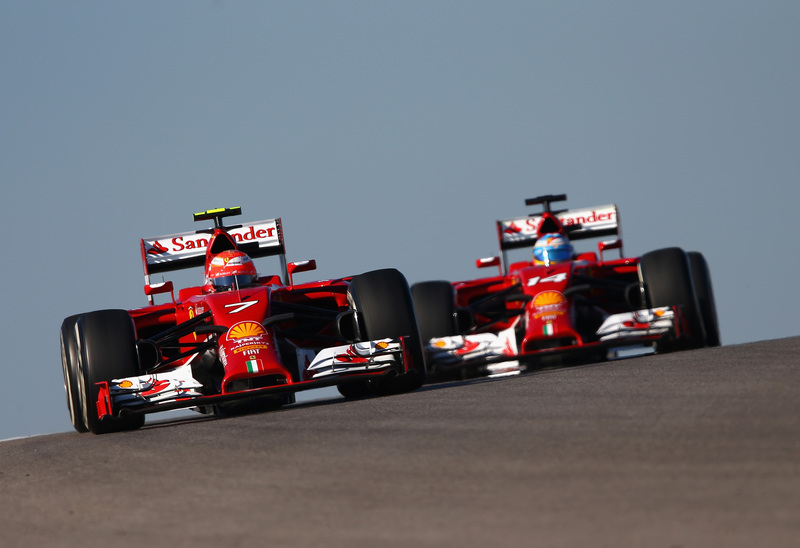 As it was, the Ferrari duo were a minute behind the Mercedes pair. it is easy to see why Alonso is considering a switch to McLaren-Honda—or maybe even sports car racing—for 2015.